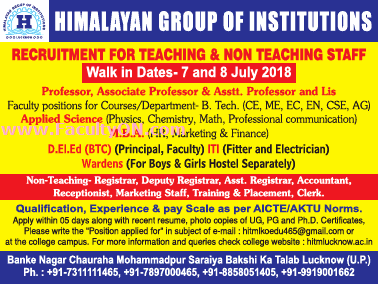 Himalayan Group of Institutions Lucknow has advertised in THE TIMES OF INDIA newspaper for recruitment of Professor / Associate Professor / Assistant Professor Plus Non-Faculty jobs vacancies. Interested and eligible job aspirants are requested to apply within 05 days from 4th July 2018 or Walk-in on 7th and 8th July 2018. Check out further more details below. About College: Himalayan Institute of Technology & Management is an extended body of Himalayan Public School Sewa Sansthan, spread over 27 acres of land HITM is just 20 Kms away from the heart of the Lucknow city. The green sprawling ambiance is conductive to calm and peaceful academic pursuit. How to Apply: Interested candidates are requested to apply within 5 days along with recent resume, photo copies of UG, PG and Ph.D certificates, write the "Position applied for" in subject of email or apply by post or attend the Walk-in interview.